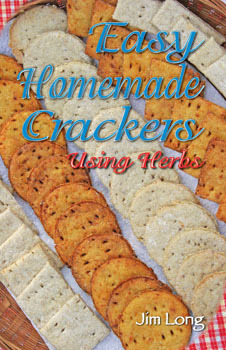 The focus of the video is my Homemade Crackers and Easy Dips with Herbs books. 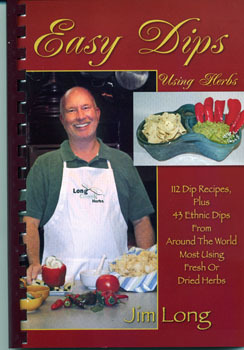 You've probably heard me mention before that we have a YouTube/longcreekherbs channel where we post videos of my recipes and books. Check it out if you haven't. Yesterday we filmed 2 more videos. That's the easy part, the editing and pasting it all together is the harder, and more creative part. Thankfully, my job is to stand in front of the camera and let David Selby and his associates do all the work. Here are some views of the photo shoot from yesterday, with his helper, Ben Manlove. The end product will be 2 videos, one that will be about 3-4 minutes long, where I'm showing my friend, Makala, how I make cheddar crackers. The other is a 2 minute video telling what roses are good to eat and which ones to avoid. (There's more about the Herb of the Year and the Rose, official Herb of the Year for 2012, on my Herb of the Year blog, here). In a few weeks the videos will be up on our YouTube channel, but for not they're "in the can" awaiting the editing process. Makala is the daughter of one of our employees, Neva Milke. Neva is one of the 2 ladies who answers phones when you call us to place an order. Makala first came to visit Long Creek Herb Farm when she was 4 years old, with 19 other vacation Bible schoolers. She was interested in herbs and gardening then, and her interests continue to grow. 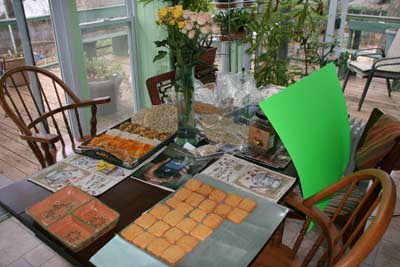 I invited her to be a part of Homemade Crackers with Herbs video taping and she was fun to work with. 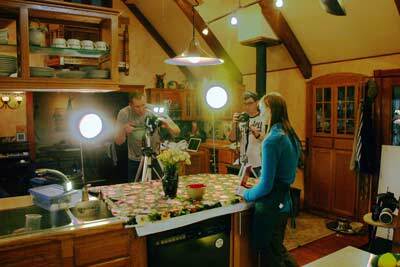 Here are some scenes from the kitchen and the crew yesterday. 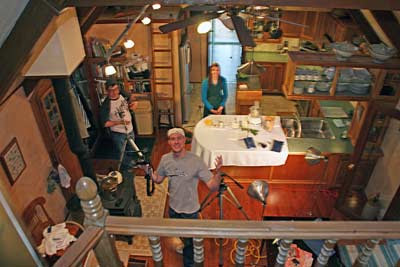 I took this photo, looking down into the kitchen from my upstairs office. 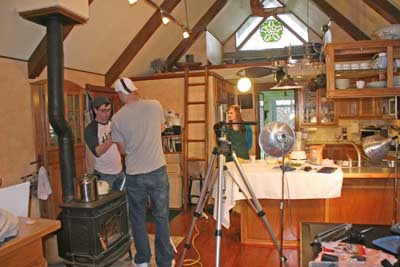 You can see the kitchen counter all set with our working tools, David and Ben are getting the cameras and lights set up. Everyone just discovered I was taking their pictures, too. David does lots of film projects. He intends to make movies but for now, does a great job doing videos. Ben Manlove, to the left, grew up with David in Reeds Spring, MO. Ben is in the Army Reserves and is currently attending Drury University School of Nursing. 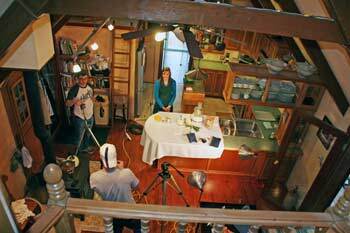 Makala, standing on set at the ready, is a second year student at College of the Ozarks. It takes a lot of tinkering with lights, sound, cameras to get everything working right. Out of camera view, on the sunporch, I had backups of the crackers, the baked crackers, the unbaked ones and the roses for the what roses to eat video that came next. And here we are in front of the lights, almost ready for the rose video. Makala was patient and fun to work with. David and Ben were loads of fun and very professional. David's production company does an outstanding job. 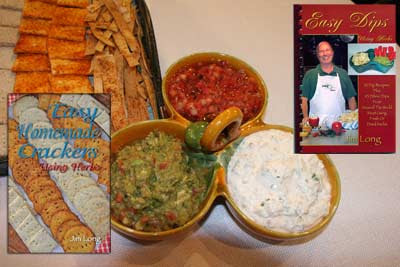 All the recipes for the crackers and dips came from my books. I hope each and everyone a pleasant and peaceful holiday season. Purple, red and white turnips. I went to the grocery store today, rather, to the garden for some produce. We have 3 small beds of turnips, planted in mid-August. Turnips are best after a bit of cold weather and these are the first we've pulled. On the left is the old-fashioned purple top, this one weighs about 2 lbs. 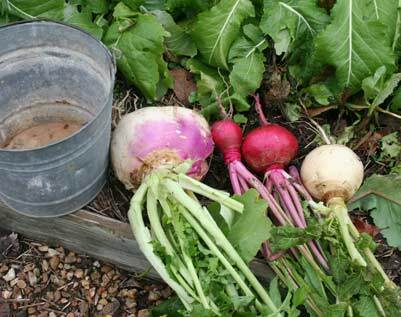 In the middle is an heirloom variety called Red Round, a sweet, mild turnip. On the right is a white Japanese turnip, incredibly mild and tasty. On the left, some Russian kale, some lettuce, turnips, tomatoes. I picked some Russian kale, on the left. 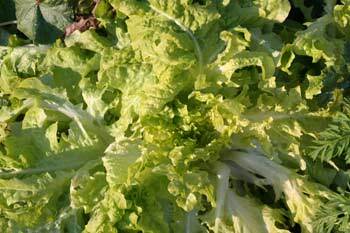 That's just one head of lettuce from the lettuce bed. 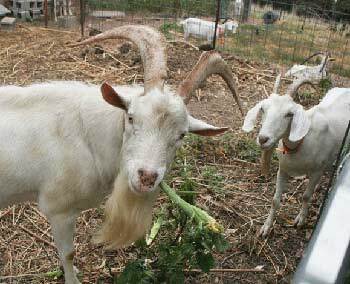 Next are the turnips I just pulled. Behind those are the last of the green tomatoes that have been ripening on the kitchen counter. I think we may still have 3 or 4 for salad on Christmas day. And in the background are jars of the applesauce Josh canned yesterday. 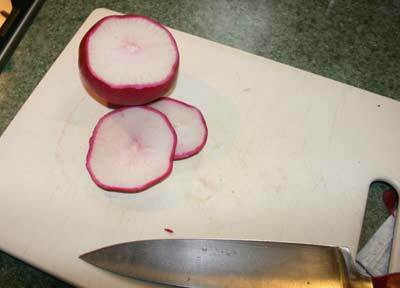 The red turnips are white inside. The old fashioned purple top turnips are best with the peelings taken off but I didn't peel the red ones as the outside is tender and not bitter. All 3 colors of turnips were sliced up into a pot with a little bacon and buter and simmered slowly for several hours for supper. 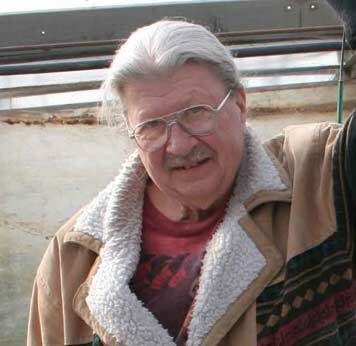 My friend, Olee runs Spring Fever Greenhouses. 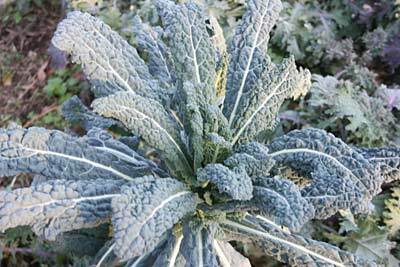 My friend, Olee Jobe, at Spring Fever Greenhouse, told me the other day he'd made kale flakes. I've eaten them before but don't remember if I've made them myself. So today I picked several leaves and made a batch. Olee's method, which is better than what I did, was to cut the leaves up into bite sized pieces in a bowl and sprinkle a little oil and toss. I thought this would be a short cut, I sprayed the leaves with cooking oil on both sides. 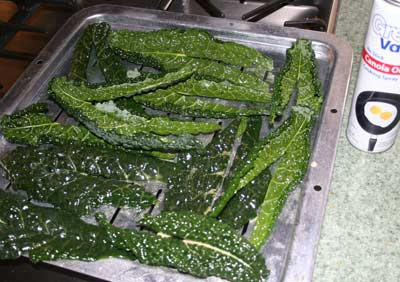 The next step is to put the leaves into the oven at 200 degrees Fahrenheit for about 1 1/2 hours. They may look odd here in the photo, but the leaves are crisp and tasty. I sprinkled salt over and they make a nice snack. Next time I will spray a lot less oil. I think they'd work in the food dehydrator, as well. 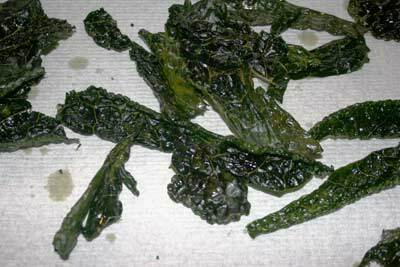 Oddly enough, kale flakes are good with sweet, red grapes! Or cheese. They'll keep crisp in an airtight container but I doubt these will last past suppertime. You may not want to know this - but it is part of farm life. Packrats get into chicken feed, tunnel into the garage, carry off shiny objects and store them in their nests. 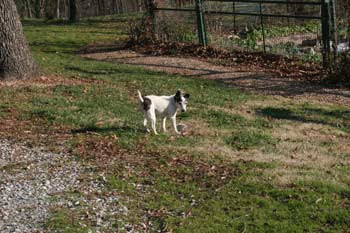 They're a pest and between Squeak, the cat, and Molly, our Jack Russel, the two harvest a pack rat a week. If they didn't, we'd be over run with the varmints. Molly got one last week and this week, another one. When she offs a pack rat, she carries it around to show everyone - not unlike the guys who strap their just-killed deer across the hood of their truck and drive around the neighborhood. Molly is standing in the driveway, waiting to show me her trophy. The next part of the trophy demonstration is, you are supposed to go see the rat and attempt to pick it up. Molly, of course, is ready since it's her game and she grabs it and runs off a few steps, drops the rat and looks back to make sure you're still playing the game. Steve, June, Barbara, Sarah and Josh. 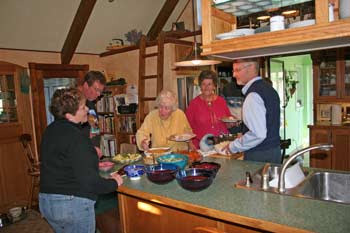 This is part of our Friday night dinner group, getting ready to eat, recently. Certainly not everything came from the garden, but we're grateful to have food right outside our door. 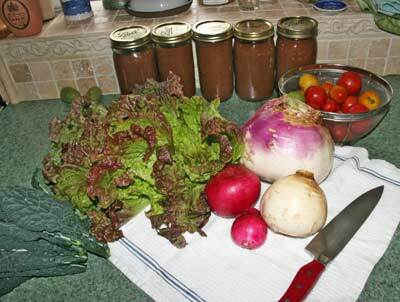 I can smell the turnips cooking right now, they'll be ready for supper. Today I planted bulbs I'd ordered a couple of weeks ago. It was sunny and in the low 40s. 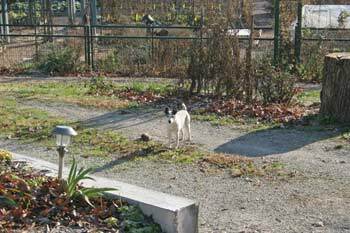 Following here are some views of what our garden at Long Creek Herb Farm looks like today, December 10. You'll notice there's still quite a bit of green in the garden. Even though we've had nights and days in the 20s this past week, lots of winter vegetables and greens will take being frozen. But first, I discovered this little guy under the leaves as I was planting the last of the bulbs. He's shy, and cold and hardly moving at all. We don't see salamanders often here. 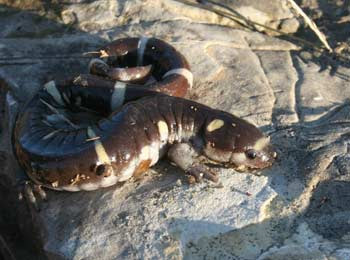 This one is a ringed salamander, to read more about Missouri Ozarks Salamaders, check here. After taking his picture, I put him back under the leaves to go about his business of salamandering. Ringed Salamander. No, it's not a lizard. 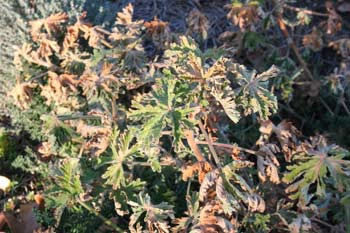 Rose geraniums will take quite a bit of cold. This one's been frozen all week yet has enough life left that I could, if I wanted, pot it and bring it indoors. 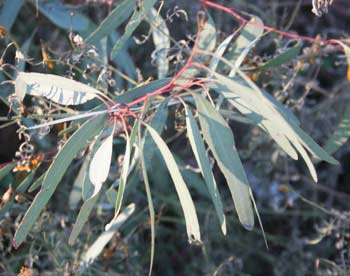 Above is lemon eucalyptus, which I grow as an annual. It, too, will take quite a bit of cold. Probably I could winter it over in a cold frame but instead I just replant each year. Cardoon, a vegetable lots of people don't know much about. Cardoon, too, withstands cold temperatures until it gets down below 20 degrees and stays, then it dies down to the roots to reemerge next spring. Cardoon is a biennial so this one will bloom next summer. 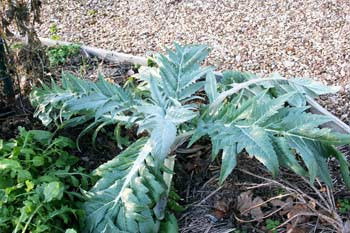 Cardoon is a first cousin to artichokes. Lettuce looks like a fragile plant, doesn't it? 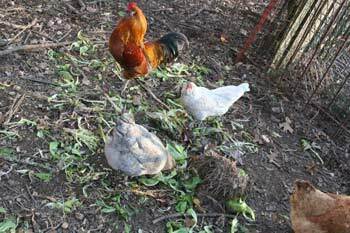 We picked several heads today for salad for tonight's supper and some for the refrigerator. This isn't mulched nor is it in the cold frame, this is just growing out in the open bed. Several varieties are all doing just fine. 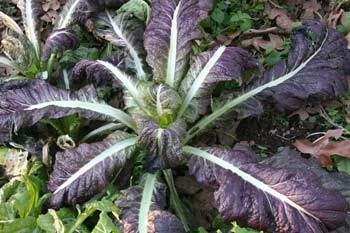 The Japanese red mustard has a snappy, zippy flavor that mixes well in salads. It's still surviving in the winter garden. The chickens get to eat some salad from the garden, too. 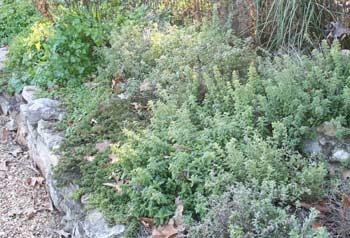 One of the herb beds. You can see we're still fairly green here. This is the bed that contains oregano, marjoram, parsley, thyme, Mexican oregano, sorrel and rosemary. It's all still nice and green, even after the brief snow we had last week. 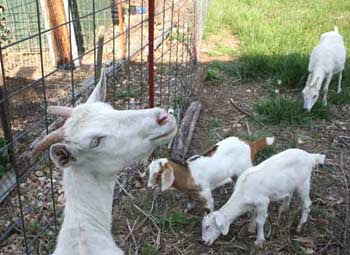 Allium and her 2 twins. So that's about it, late afternoon photos of our winter garden. We're having cabbage and salad greens from the garden with egg rolls and steamed Chinese dumplings. They may not go together, but hey, most of it's from the garden! Hope you enjoyed the short tour of what's still growing in the Ozarks. Don't forget, if you want to take advantage of our Frankincense and Myrrh Special, visit my website to check it out. For a story of what frankincense and myrrh is, click here, it will take you to another of my blogs. Stay warm everyone. I don't leave my farm every day, but when I do, I pass the passion vine that grows across the road from my house. We're 20 miles from a grocery store, 6 miles from the nearest Post Office, so trips out are for accumulated errands. But each day that I do drive out, I can't help but notice this plant. I've decided to write about it here, not because it's in bloom, but because the fruits are ripe, now. You may not know this plant even though native varieties grow in many parts of the world. You would probably recognize the flavor, even though you don't realize it - you've likely tasted it in "tropical punch" mixes, either canned or bottled. Tropicana tropical punch, for instance, has passion fruit as one of the flavors. The fence across the road from my house is the perfect spot for passion vine. If you look up passion vine on Google, you'll find the phrase "passion vines are mostly tropical." It's true, there are lots in the tropics, some with larger fruit, some with smaller, with varying colors of flowers. 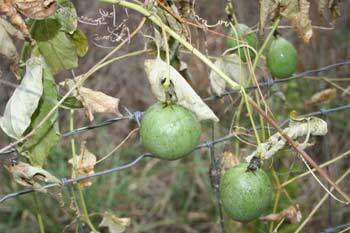 However, the native passion vine (Passiflora incarnata) grows from Pennsylvania to Florida, Texas to southern Missouri, where I live. It grows in full sun so if you were to go on a walk in Ozarks woods, you'd find it growing in meadows and open areas. 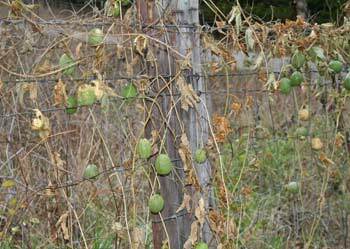 The plant climbs to about 30 feet and will climb a trellis but seems happiest climbing over waist-high plants or up onto fences. It spreads from the roots, so if you think about planting it in your garden, you might reconsider where it goes, or plant it in a large planter. Years ago I mistakenly planted some seed (from some I'd cooked and thrown away after straining) along my garden fence and by the second year, had sprouts coming up in my pathways and other planting beds. It took several years of weeding to finally get it out of the garden. If you're interested in where the plant got its name - invented by Spanish Catholic missionaries in order to convert the Natives to Christianity, you can read the history here.You may recall the missionaries gave the Natives a choice: convert or be killed. I'm not a fan of the story. The fruit, not yet ripe, on November 30. 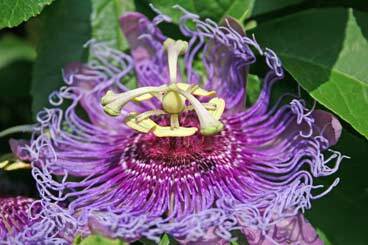 What's so special about passion vine, you may be wondering? It's attractive in summer with lush, green foliage that quickly covers an arbor or trellis, and the lavender to purple flowers. But there's much more than just a green vine, to this plant. The fruit has a tart, tropical flavor. When you see the seed, surrounded by a small amount of flesh, you don't instantly think, "gotta eat that." But think about pomegranates, similar in that you eat the flesh surrounding the seed. The fruit doesn't get ripe and develop its flavor until it has shriveled and turned from green (see the one at the top of the plate, above) to light tan. 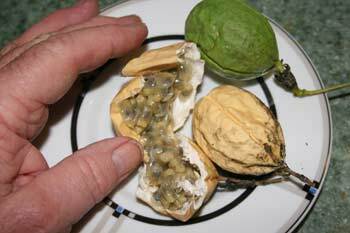 To use the fruit, scrape out the seeds and flesh, discarding the peeling. Put the seeds into a saucepan with a cup or two of water and simmer for about 10 minutes. Run the pulp and liquid through a colander (or a potato ricer works even better), collecting the juice and pulp. You can mix it with sugar and more water, or cook it down to a sauce. Several years ago my partner, Josh, made pie filling like you would make for a cream pie, combining passion fruit pulp, then made cream puffs and stuffed the cream puffs with the passion fruit custard. They were outstanding! But passion vine's real claim to fame is its use as a sedative. 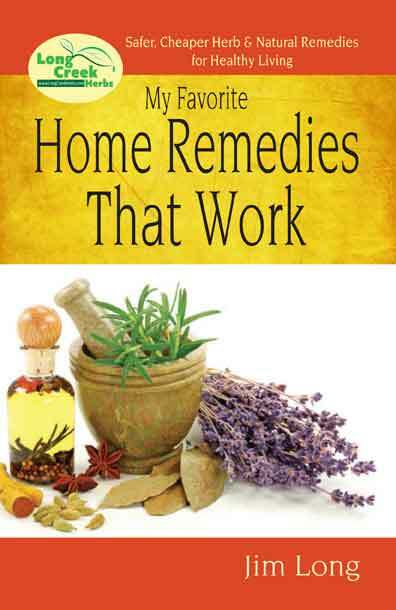 If you buy sedative or relaxing herb capsules in the health food store, often labeled as, "Valerian Combo" you'll find in the list of ingredients: valerian (a relaxing herb used for back aches), wood betony (another relaxing herb) and passion vine herb. Passion vine herb (the leaves and growing tips, dried) is a good sedative by itself and can be found in the supplements aisle of many stores by itself. When I have back aches, I often turn to the Valerian Combination capsules. Or you can make a tea of passion vine herb, although it's not very tasty. 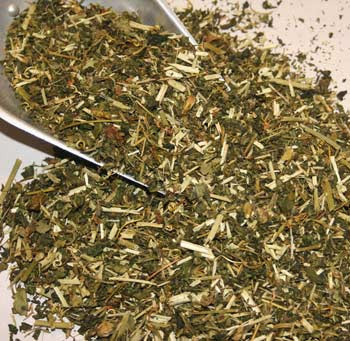 It's good in relaxing herb blends for people who have difficulty sleeping - which is also why I put it into my Restful Sleep Dream Pillow blend. Passion vine is an herb we carry in our shop. It's an ingredient in some of my relaxing dream pillow blends and we sell it in pound and half pound amounts for folks who are making dream pillows. (To learn more about dream pillows, visit my website, or my Dream Pillows blog). 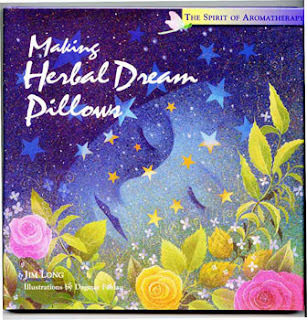 You might also enjoy my book, Making Herbal Dream Pillows which has been in print since 1998 and available on my website. I started writing about dream pillows in the early 1990s and have published 3 books on the subject. Back then, most people had no idea what a dream pillow was. Now I find my words and formulas copied or imitated on lots of other websites. I have to take it as a compliment, even if I don't get credit. 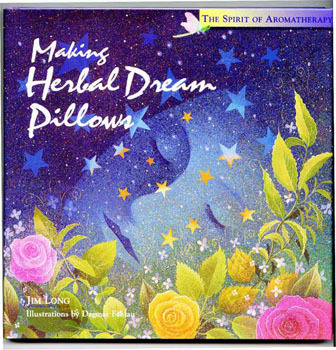 My book of herb formulas and history of Dream Pillows. Every time I pass the plant I remember those cream puffs, filled with passion fruit custard. The fruit is ripening still, even this late in the year so maybe I'll gather up a batch and cook up something. 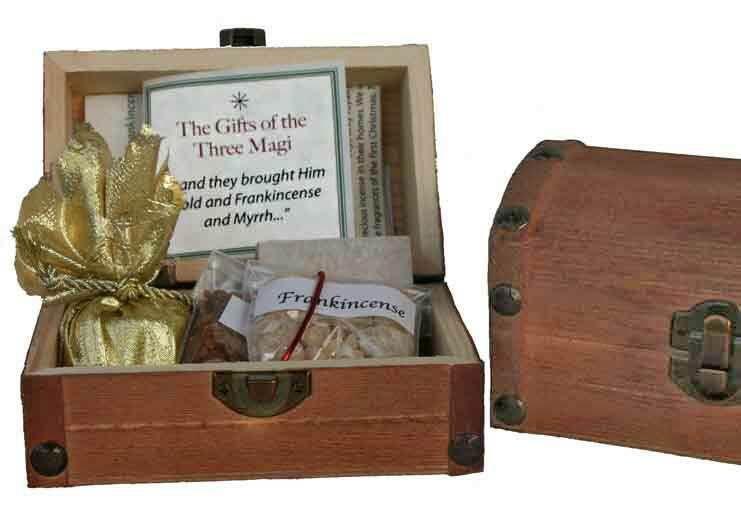 Visit our website where Frankincense and Myrrh Kits are on sale. 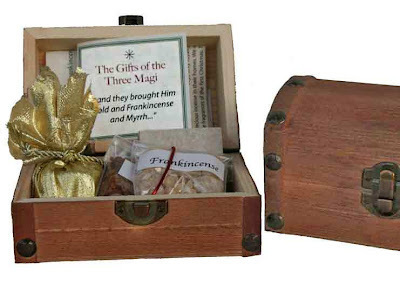 Frankincense and Myrrh Incense Kit $12.95 plus shipping; 2 for $25.